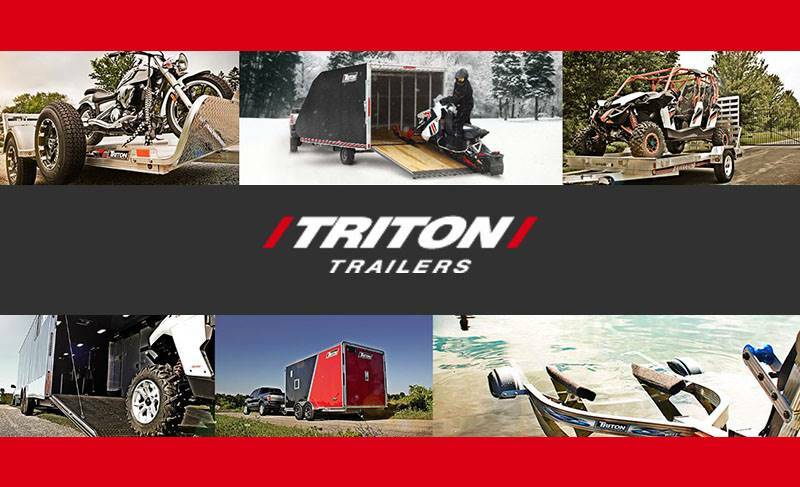 The Prestige Series is designed for multi-season and multi-sport hauling, whether across town or across the country. Standard Prestige trailers are often customized with storage and tie down options for hauling snowmobiles, off-road vehicles, motorcycles, and gear. 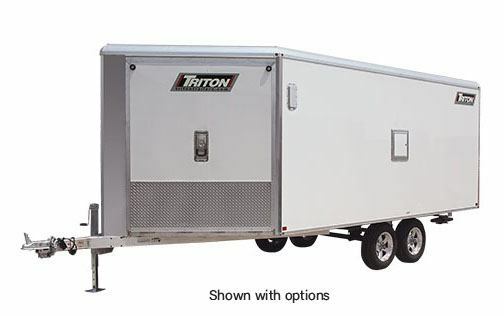 The Prestige Series has Triton’s construction, fit and finish and offers the following standard features. All-aluminum tube construction with fully welded lower and upper frame. Sealed wiring for LED trailer lights is encased in aluminum tubing. Spring-assist front and rear ramp doors with welded, grease zerk hinges. Four cord rubber torsion axle with optional electric brakes. Fully treated 5/8” marine grade plywood decking. 1600# tongue jack offset at V-nose prevents interference when opening most tailgates. Aluminum wheels: 13” radial tires (8’ wide model) or 14” radial tires (7’ wide model) with aluminum rims. Adjustable Tie Down Positions: Two full-length Quickslides provide infinite tie down options. Tie down bars included. Multi-Use Carrying Capacity: Fixture-built frame with custom extrusions has 19” on center (8’ wide model) or 24” on center (7’ wide model) floor crossmembers. Easy Entry and Exit: Ramp approach has a built-in transition for easy loading. Straight tongue with A-frame bracing. V-nose design adds 5’ to usable deck length. Two interior LED dome lights. Smooth Aluminum Skin: Bonded (screwless) .030” aluminum panel exterior. Tall aluminum diamond plate stone guard at V-nose. Double-Seal Ramp Doors: Spring-assist ramp door with double seal prevents leaks, keeping cargo dry. Rear - 69 in. up to 87 in. *Price, if shown, does not include government fees, taxes, dealer vehicle freight/preparation, dealer document preparation charges or any finance charges (if applicable). Final actual sales price will vary depending on options or accessories selected. NOTE: Vehicles with a price of "Request a Quote" are always included in a $0 search, regardless of actual value. *Suggested Retail Price (SRP) excludes destination charge. Visit powersports.honda.com to view applicable destination charge amount.